^ Clarke, Asia Booth (1996). Terry Alford, ed. 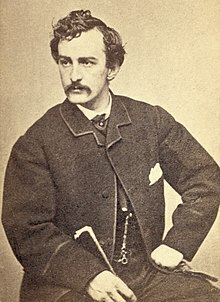 John Wilkes Booth: A Sister's Memoir. Jackson, Miss. : University Press of Mississippi. p. ix. ISBN 0-87805-883-4. ^ Tom (2013-09-12). 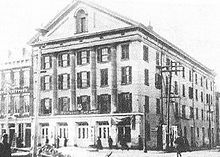 "John Wilkes Booth's Family on North Exeter Street". Ghosts of Baltimore. Retrieved 2019-02-17. ^ Tom (2013-09-09). 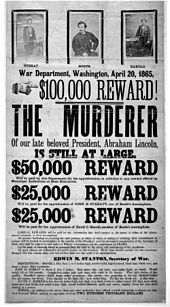 "Original Ad For John Wilkes Booth's Acting Debut". Ghosts of Baltimore. Retrieved 2019-02-17. ^ Mudd, Samuel A. (1906). Mudd, Nettie, ed. The Life of Dr. Samuel A. Mudd (4th ed.). New York and Washington: Neale Publishing Company. pp. 20–21, 316–318. ^ a b c Garrett, Richard Baynham; Garrett, R. B. (October 1963). Fleet, Betsy, ed. 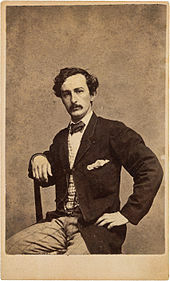 "A Chapter of Unwritten History: Richard Baynham Garrett's Account of the Flight and Death of John Wilkes Booth". The Virginia Magazine of History and biography. Virginia Historical Society. 71 (4): 391–395. JSTOR 4246969. ^ Kauffman, Michael (May–June 1995). 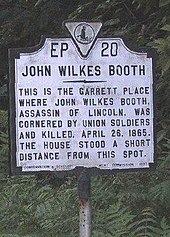 "Historians Oppose Opening of Booth Grave". Civil War Times. 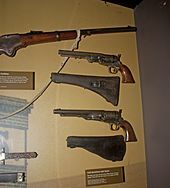 This page is based on the Wikipedia article John Wilkes Booth; it is used under the Creative Commons Attribution-ShareAlike 3.0 Unported License (CC-BY-SA). You may redistribute it, verbatim or modified, providing that you comply with the terms of the CC-BY-SA.